Purple Leaf Farms: What About Water? If you live in the Chicago area, you know how incredibly dry the weather has been this spring. Since I began planting the Mini Farm two weeks ago, Chicago has only received 0.2 inches of rainfall. Also, its been really hot. The day before Memorial Day set a high temp record at 97 degrees for that date for a long as records have been kept. Needless to say, these are not ideal conditions for planting out a farm. 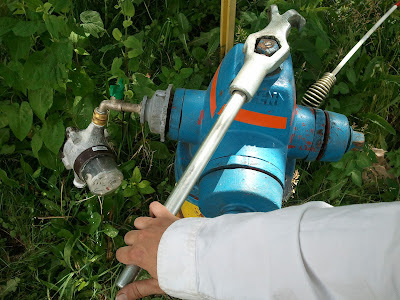 Luckily for me, I do have a water source on-site at the farm, in the form of a fire hydrant that's been fitted with a water meter and a small spigot, similar to the type that would come off of your house. I learned a lot about hydrants from the water department guys who were so kind as to get the water working for me. For instance, did you know that the color of the top of a fire hydrant relates to the size of water main the hydrant is on? Also, at least here in Forest Park, there's also color coded tape around the neck of the hydrant that relates to the rate of flow the hydrant provides. Operating a fire hydrant is pretty easy, although you have to be careful and observant to make sure that you don't cause any water main breaks or leaks. For instance, I was shown how to use a big ole wrench to open the hydrant and told to "don't do it like they do on Backdraft" but instead turn the wrench really slow. This helps insure that the hydrant opens all the way and that you don't blow out the water main. Can I tell you how much of a disaster it would be if I blew out a water main due to using water for the Mini Farm? It would be an actual water disaster as well as a PR disaster. Needless to say, I'm being really careful with the hydrant! 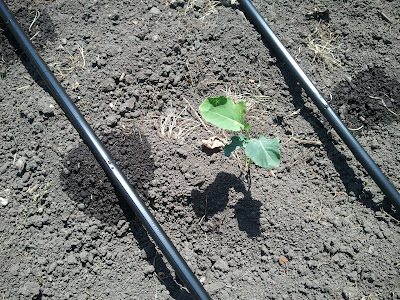 I decided to use drip irrigation at he Mini Farm. Drip is supposed to be the most efficient--as in saves a lot of water--way to water small-ish agricultural projects. I went with a product called Irri Gator, which I had used previously for the community garden and which this year is now being sold by Johnny's Select Seeds which is one of the go-to seeds and supplies provider for actual farmers. I ordered directly from the Irri Gator company, not Johnny's. The prices seemed to be the same and the Irri Gator page offers more flexibility in the quantities of certain pieces of the system. Also, the guy who owns the Irri Gator company is AWESOME and will walk you through any installation problems you have. For those of you in the Chicago area, Irri Gator is also somewhat local, as they are located in northern Indiana. The Irri Gator consists of solid tubing (carries the water from the source to the drop hoses) and drip hoses which have tiny little slits every 12 inches or so that release water at the rate of about two drops per second. It takes a while to get all the hoses laid out and connected. Using the punch tool was a lot harder than I anticipated but then again I am a weakling when it comes to upper body strength. As of yesterday, I have about 80% of the drip system installed. The drip system waters very slowly, so the idea is that you leave it on for hours at a time. It has been so so hot and the soil was already so so dry that I left the drip on for about 10 hours a day for three days in a row. Finally, the soil is starting to get saturated and the plants are really starting to take off. When you look at the Irri Gator while its on, you'll see small little circles of wet soil form on the surface around each slit where the water drips out. The circle of wet soil doesn't cover the full surface area of the soil. If you're like me, then you worry that its not going to adequately water the plants. But, if you take a hand spade and dig down as little as three inches into the soil--even a patch of soil that looks completely dry from the surface--you'll find that the water does indeed wick throughout the planting area. So, even though it may not appear so from observing the surface of the soil, the Irri Gator really does cover the area it says it will cover. My rows are about 36 inches wide and I have 2 drip hoses per row. So far this seems to be great coverage. 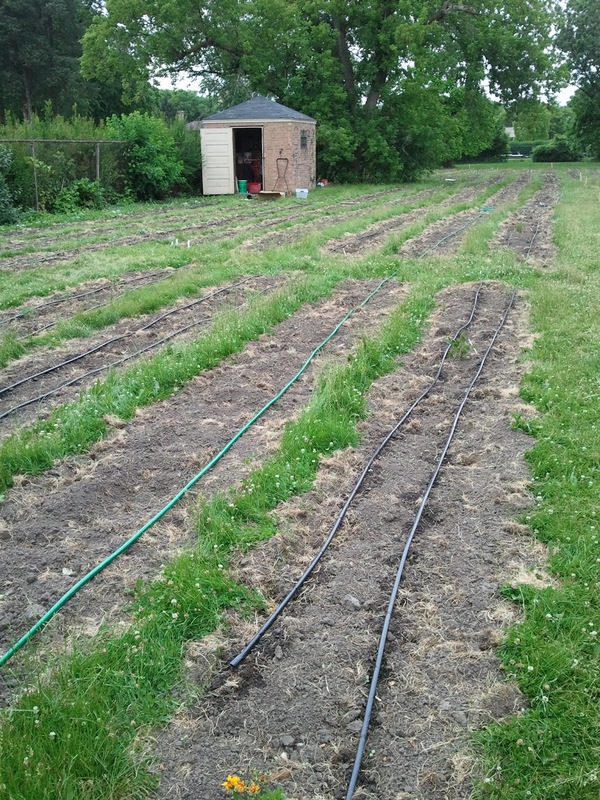 If you wanted to use drip irrigation in your garden, your spacing may be a bit different depending on the water retention qualities of your soil. I can't tell you how happy I was to get the water on and get the irrigation system working. I was at the garden by myself and once everything started working, I jumped up and down and couldn't stop smiling. Which I had someone there to share my joy with, but allas the only company I had was the plants and birds. There is one thing the drip irrigation wont do, at least given my soil consistency, and that's provide surface moisture to direct-seeded seeds (unless the seeds are planted really deep). I've done a LOT of direct seeding with this project and most of them have yet to germinate. Even though I've got the drip system on, I'll still need to hand-water (using a hose with a sprinkler head) the surface of the beds where I've recently seeded in order to get the first couple of inches moist. Thankfully today it is actually raining! Scattered showers are predicted for the next few days so if I'm really lucky the rain may do my job for me. If things dry out, I'll be over there watering everything by hand until the seeds germinate and get somewhat established. This is probably way more details regarding my irrigation system than you ever wanted.